My large ears are one of the first things that some people notice, but when they get to know me better, they notice my endearing personality and forget about my big ears. My coat is short and fine and doesn�t require any special grooming, and my small size is ideal for city life. I am not a �yapper� and I am certainly not a strong, intimidating watchdog, but I will let you know if somebody is messing around our house. I have basic good manners, and it doesn�t take me long to learn and respect the rules. Snorting when I get overly excited and snoring when I am asleep are such minor things that I hate to take the time to mention them, but I guess I should. When fully grown, I am about 12 inches tall (30.5 centimeters) and I weigh between 22 and 28 pounds (9.9 to 12.6 kilograms). We have no French Bulldog Breeders listed at this time. 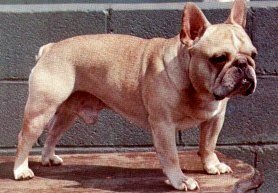 Click here to place your French Bulldog Ad!